-Balance of Performance and physics update. See the readme for details. -Single compound tire is now the base installation. Multi compound is available as an add-on at the download link below. -Removed random service delays during pit service. -Pace car is now included in the package - no need for separate download. -Common/shared files are now included in the package - no need for separate download. 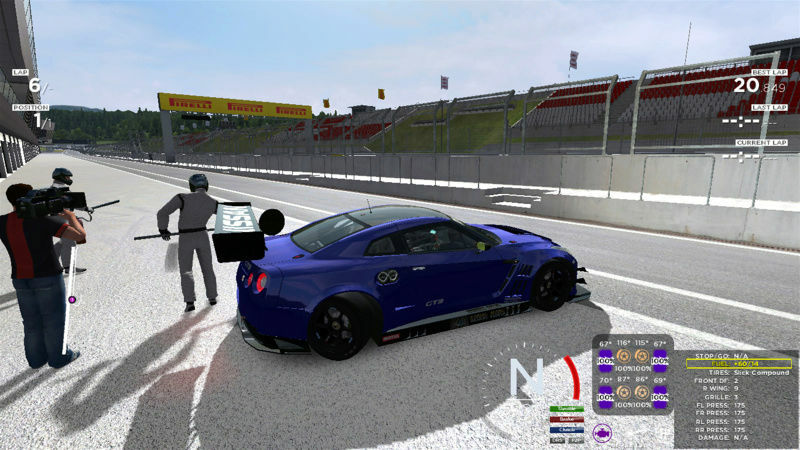 -See the readme for the EEC Endurance Series Mod V2.2 if you are installing both Mods. there can be conflicts with other gt3 mods in case of a same car naming for example what can cause in a game crash or other strange problems ingame! be sure you also downloaded the eec safetycar and eec shared textures!!! i dont want to see these cars on any leagues beside ours, im ok with it if you drive on a different time zone and wont conflict with our racetime which is always sundays cet 8pm as we still try to get full fields... it would be very bad to see 10 other sites hosting leagues with it and just having 5 drivers, isnt it better to run together with 30-40 people? its not allowed to use these cars for any commercial use!!! i dont make money with these cars, everything is for free so same for you!! reiza - for its great sim and always having an eye and open ears for the community! this mod is final now and there wont be more updates! unpack and drop into your ams install, if a message appears to overwrite files click on yes all! Finally, just small thing I saw for now: Viper CC should have also windows textures from inside, because without side windows you can easily see to the cockpit and it doesn't look good. FYI, I had no damage with the car, just did a stop and somehow the wheels went the wrong way. All wheels went strange during the stop when the car went up, but when the car went down again the other three wheels were ok again. Really looking forward to trying them out, and thanks a lot to everyone for the hard work!! The only way to God is called Jesus, not religion, just Jesus. Awesome job PATR10T. Thank you very very much. Absolutely impressive mod, thank you so much PATR10T! I quick tested all the cars and had no issues, except a small thing for the Mc Laren MP4-12 GT3 which has untextured rollcage in the cockpit view (the upper rollcage padding pieces - to be more precise). Reiza Studios made a different format of the .tga's of every pack showing the label and a car's profile example for every series in it. Now the stupid question: Are you planning on updating the tga? Anyways, top notch work. Of course, the AI is not perfect BUT is supprisingly more than acceptable, they fight the position sometimes. For better AI I would reccomend to run a Qualify Session of at least 15 minutes. Again, great work, this is 9/10, with updates and fixes will sure be 10/10. Amazing models. Thanks for this "Hammer" Mod! Now with the Update 1.1. no crashes anymore. @deadlok wrote: Absolutely impressive mod, thank you so much PATR10T! I quick tested all the cars and had no issues, except a small thing for the Mc Laren MP4-12 GT3 which has untextured rollcage in the cockpit view (the upper rollcage padding pieces - to be more precise). big thx, speechless, some first tests let us touching cars not turn around them in a second, great 4 little online mistakes happens often, really nice ! vehgfx.cpp 2265: Could not find instance "SLOT000"
Do you know what could be causing this?